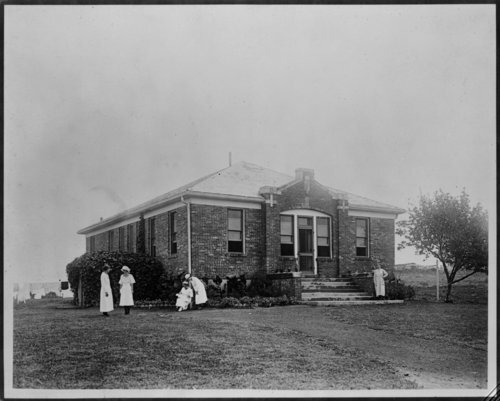 A photograph of women outside an unidentified building at the Kansas State Women's Industrial Farm in Lansing, Kansas. This facility was established in 1916 and for the first year it was a branch of the men's prison at the Kansas State Penitentiary in Lansing, Leavenworth County, but it began operating as a separate satellite unit in 1917. The Industrial Farm was under the supervision of the State Board of Administration before coming under the control of the Board of Penal Institutions, which was eventually reorganized as the Department of Corrections. It housed women who had committed crimes against the state. In 1980, the facility became co-correctional and in 1983, the name was changed to the Kansas Correctional Institution at Lansing.